Last week, quite unnoticed by Chenna-ites, the city has earned a shame for itself. The shame of hosting a proclaimed anti-national who goes by the name of Umar Khalid. Yes, the same Umar Khalid who on Feb 9th, 2016 was caught on camera demonstrating inside the campus of New Delhi’s Jawaharlal Nehru University in support of the Dec 13, 2001 Parliamentary attack mastermind Afzal Guru and Maqbool Bhat, another Kashmiri separatist who co-founded the militant outfit called Jammu Kashmir Liberation Front. During the Feb 9th demonstration inside the JNU campus slogans such as – “Kashmir ki azadi tak jung chalegi, Bharat ki barbadi tak jung chalegi“ (“War will continue till Kashmir’s freedom, war will continue till Bharat’s demolition”) and “Tum kitne Afzal maarogey? Har Ghar se Afzal Niklega” (How many Afzals will you kill? Every house will give rise to other Afzals) were raised. Umar Khalid was reportedly seen on camera in the lead of such anti-Bharat sloganeering. Yes, the same Umar Khalid whose father is a former Chief of the now banned terrorist outfit called Student Islamic Movement of Bharat – SIMI. Delhi Police sources claim that this SIMI was later transformed into the Indian Mujahideen (IM). The IM has been involved in a number of terror strikes that claimed the lives of many innocent Bharatiyas including women and children. Umar Khalid along with Kanhaiya Kumar, Anirban Bhattacharya and few others were the main organisers of the rally in the aftermath of which a huge controversy erupted. The entire nation condemned the support being lent to terrorists at taxpayer-funded Universities like Delhi’s JNU. Umar Khalid was rightfully charged with sedition and later rusticated by the University administration. Intelligence reports claim that Khalid and his associates had planned to conduct such rallies in 18 Universities across Bharat and in effect stoke a larger anti-Bharat movement which will eventually lead to the disintegration of Bharat – the stated objective of many terror outfits that operate their cells in different parts of the country. At the height of the controversy, the Delhi Police attempted to arrest Khalid. However, the scared Umar Khalid and his fellow comrades went into hiding only to emerge 10 days later when they were taken into custody by the Delhi Police. A Delhi Court later granted him an interim bail for 6 months. In a Facebook post on July 8 2016, which was subsequently deleted, Umar Khalid reiterated his ideological support for Kashmiri separatism after the killing of Burhan Wani, a terrorist of Hizbul Mujahideen who was killed in an encounter with the Bharatiya Armed forces. When faced with criticism for supporting a terrorist and a militant outfit in his post, he allegedly deleted the post. Although he prefers to be referred to as an atheist, one can find Islamist organizations like Jamaat-e-Islami enthusiastically publishing his articles. 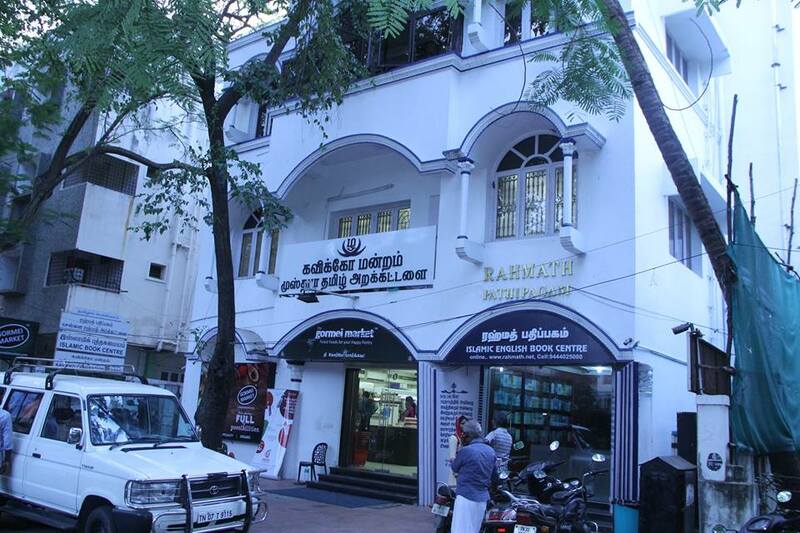 It is to be noted that it was also an Islamist organization that provided the venue for Khalid’s talk in Chennai. In a 2009 documentary titled ‘Islamophobia’ Umar Khalid is seen to be espousing the Muslim cause and lending voice against what he perceives to be discrimination of Muslims in Bharat. So, one the one hand he prefers to be referred to as an Atheist or a Communist and opens and concludes his speech with – “Laal Salaam”, and on the other hand he enjoys a healthy and mutually beneficial relationship with many fundamentalist Muslim organizations – one is able to clearly see through the mask he wears , the hypocrisy he displays and the blatant attempt to fool people over his ideological leanings. However, it is common knowledge that Communists and Islamists have on many occasions come together to collude on the shared goal of ‘breaking Bharat’. It surely looks like Umar Khalid, Communist or Islamist or whatever he is – is a self declared anti-national. It is also a not-so-well known fact that Khalid was a member of the now defunct Democratic Students Union (DSU) which did not believe in contesting elections and has himself chosen to not run for elected office in JNU’s student body. Here is a man who does not believe in democratic elections and yet claims to be fighting for a referendum in Kashmir. Here is a man who wants to project himself as an atheist, but then plays his Muslim identity card when cornered. 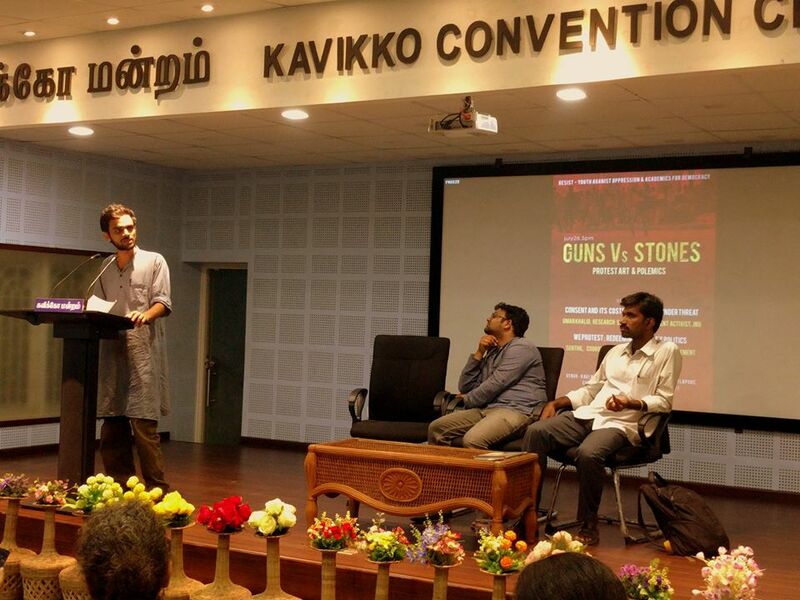 It is this Umar Khalid who was invited to deliver a talk on July 26th at the Convention Center at Rahmath Publications in CIT Colony, Chennai. The program was organized by a group that calls itself RESIST – YOUTH AGAINST OPPRESSION. Senthil of FITE – Forum for IT Employees which was in the news during the TCS layoff of 2015 was the other speaker at this program. Clearly, anti-Bharat Umar Khalid was the star speaker and the crowd puller of the day. We learn that a well-known Christian minority education institution in Nungambakkam had the posters of Umar Khalid’s talk prominently displayed in their student’s hostel. The organizers had mobilized a crowd of some 100+ young Chennai-ites as audience for Umar Khalid. In attendance were also members from the media. While the organizers made the audience wait for more than an hour before the scheduled start of the program, the backdrop on the dais was a slide show showing images of the so-called ‘Indian Armed Forces brutality on innocent Kashmiri youth’. Pictures included that of victims of pellet gun injuries. When they finally decided to start the program, a poetry recital at the beginning of the program set the tone for the subsequent rants from the two speakers who were to follow. Right to self-determination for the people of Kashmir, armed forces excesses against Kashmiris, Bharatiya Government’s excesses in Kashmir and Bastar and the North East regions of Bharat, need to fight ‘Brahmanism’, Rohit Vemula’s death, media trial over himself and his fellow comrades were the main topics on which Khalid based his talk. In his lengthy rant over the so-called Bharatiya Government’s oppression of its own people in Kashmir and different parts of Bharat, Khalid preached that the audience must stand up against those in power and in support of the Kashmiri cause. He highlighted the plight of those “innocent” Kashmiri youth who have been the targets of pellet guns used by the security forces. “Can we truly have a free India if we continue to occupy Kashmir?” asked Khalid. He went on to question Bharat’s defense expenditure and also the presence of troops in Siachen. Tax payers must be worried about the money being spent on stationing troops in Kashmir when there are no adequate health facilities in the country, he suggested. He ranted that Brahminical forces in Bharat refused to give even a proper funeral to the jawans killed in the Pampore attack because of their Dalit identity. There were more people at the funeral of Burhan Wani than there were at the funeral of J&K’s former Chief Minister Mufti Mohammad Sayeed and this, said Khalid, is a clear indication that Kashmiris do not want to be with Bharat. It was an uninterrupted talk from the man who seemed to have volunteered to be the spokesperson of Kashmiri separatism, and the sons of Periyar went about the shameless job of giving him a platform and bringing him an audience. He calls himself a left-winger and yet took pains to differentiate and distance himself from the mainstream political parties of CPM and CPI, whose leaders, including Mr. Sitaram Yechury, were at the fore front to defend the JNU comrades in the aftermath of the Feb 9th event. They claim that their heart aches for the sufferings of Kashmiris at the hands of Bharat’s security forces, but would not mention a word about the Kashmiri Pandits who were driven away from their homes in the valley. Neither will they have any answer to the numerous terrorist strikes that have killed and maimed innocent civilians and security forces alike. While there is no need to elaborate on the dual or multiple faces and shameless alliances between anti –Bharat forces and the marriage of convenience strategy that the Communists/Islamists/ Periyarists adopt in order to break up Bharat, there are many questions on the Kashmir issue that they will never want to answer. When they cry for a referendum in Kashmir and blame Bharat for not holding one and accuse Bharat of oppressing Kashmiris, when they invoke the UN resolution and try to manipulate public opinion against Bharat, what they want to hide from the public is the pre-conditions that the UN had set for a plebiscite to be held in Kashmir. Firstly, the Instrument of Accession that Raja Hari Singh, the ruler of Kashmir, signed while acceding Jammu and Kashmir with Bharat was and is the legal basis for Kashmir to be treated as an integral part of Bharat. The first of those conditions laid out in the UN resolution is that Pakistan pull out its troops and de-militarise Kashmir – which to this day Pakistan has not complied to. So when clearly it is Pakistan that has to set things in motion and Pakistan that has blocked the process from setting in, under what valid reasons can Bharat be held responsible for anything at all? Despite enjoying unquestionable legal sanctity, Bharat, under Nehru, agreed to hold a plebiscite in Kashmir. If the real intent was the welfare of Kashmiris, then shouldn’t these terrorists and their cronies from JNU/ Communists/Periyarists etc, direct their attacks and activism against Pakistan? And what is their antidote for the deadly Islamist radicalization that has acquired deep roots in Kashmir? How do they plan to resettle Kashmiri Hindus in the valley? When instead, they target Bharat for the problem, it is either a case of mental retardation or one that clearly exposes that the Kashmir issue is bogus and the actual objective of Umar Khalid and his cheerocracy is “BREAKING INDIA”. References: News Reports from Indian Express, recordings from 26th Jun 2016 speech of Umar Khalid, recordings of 22nd Feb speech of Umar Khalid. Swayamsevak and karyakartha from Chennai; IT professional; Winner of Prime Minister's award for 'All India Best NCC' in 2003; Convener of the youth forum 'byignitedminds'.